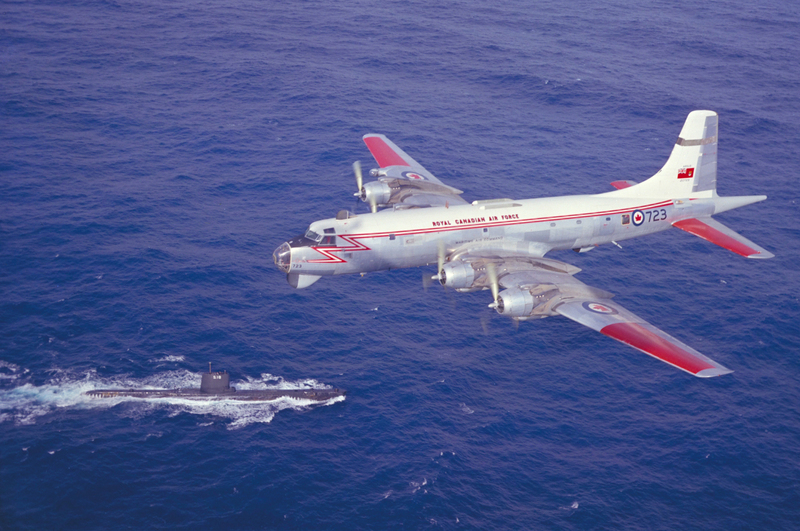 A Royal Canadian Air Force Argus passes over a submarine in the Atlantic Ocean. Five planes were delivered to the Operational Training Detachment in Nova Scotia in March 1958; in July the long-range patrol unit, 405 Squadron in Greenwood, N.S., welcomed its first Argus. The aircraft saw service on both coasts until it was replaced by the Aurora in 1981. The Argus was involved in two fatal crashes, both in March, 12 years apart. Just before midnight, March 23, 1965, during night training on anti-submarine warfare exercises 95 kilometres north of Puerto Rico, an Argus of 404 Squadron flew over HMS Alcide. Then submariners saw the glow of a crash reflected in the sky. All 15 crew and one scientific advisor aboard were killed. No official explanation of the crash was given. Twelve years later, March 31, 1977, a 415 Squadron Argus developed engine problems and had to shut down one engine about 650 kilometres out and head for an emergency landing at CFB Summerside, P.E.I., arriving in a thunderstorm. The pilot was a local who tried to avoid the control tower and the school behind it. He veered downwind and lost height, hit a snowbank and lost another engine. The pilot tried to get aloft, but hit an aircraft sitting on the ground, and began spilling fuel, which ignited. A ball of fire followed the Argus, which landed on its belly and split open. The survivors escaped through this opening. Three of the 16 crew were killed and 11 were injured.